Way, way down at the end of the road, the Mississippi River has broken through its barriers to flood the marshes of Bohemia. On April 7th, we hiked down the flooded road to take a peek, and took the kite with us to gain some perspective. For the past few years, the Lake Pontchartrain Basin Foundation has tracked wetlands and the hydrodynamics at the site, which is unique along the river for having no levee to restrain the river. In 2011, the river bucked and began to carve a new channel to the Gulf. 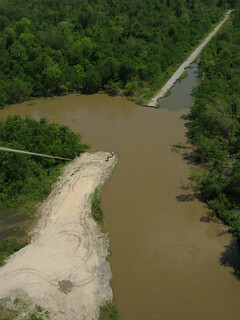 We hiked into the road breach site, and took turbidity and kite photos while we were there. The water was a bit intimidating. At the gates themselves, the turbidity readings read from 12 to 16 cm. In the boiling cut itself, turbidity was also high at 14 cm. The photo to the right shows at a glance that the swift river is ferrying sediment into the wetlands beyond. We also captured some of the 2012 attempts to rebuild the oil and gas access road across this new spur of the river.